While GBP is getting weakened due to the Housing Price Balance, USD is being supported by Initial Jobless Claims and Housing data. 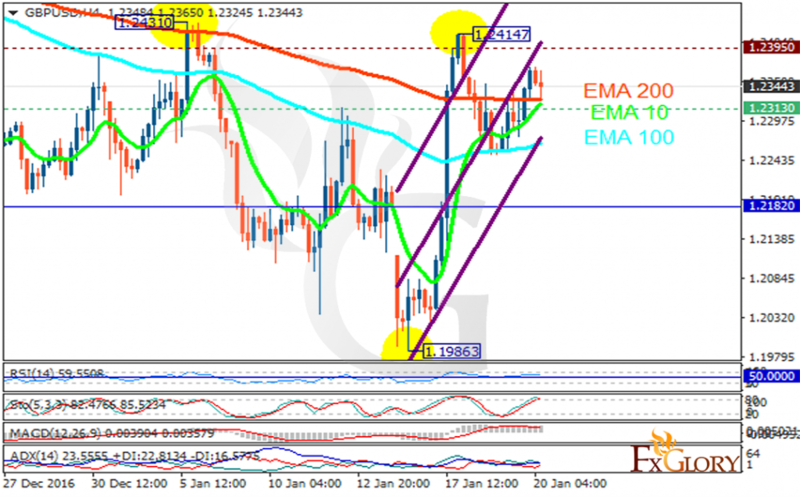 The support rests at 1.23130 with resistance at 1.23950 which both lines are above the weekly pivot point at 1.21820. The EMA of 10 is moving with bullish bias along the ascendant channel and it is getting close to the EMA of 200 but they are both above the EMA of 100. The RSI is falling towards the 50 level, the Stochastic is moving in high ranges, showing downward momentum and the MACD indicator is in positive territory. The ADX is showing buy signals. The price is falling down reaching 1.2300 area.